Swish Analytics Inc., is a sports technology startup based in San Francisco that developed algorithmic sports, predictions and betting recommendations. The three founders raised $300K in March from a group of private angel investors to deliver algorithmic sports predictions to bettors and fans in the underserved data science field. The ground-breaking movie Moneyball, opened the public’s perception to sports analytics and daily wagering sites such as FanDuel. The Sports Techie community blog spoke to Swish co-founder, Joe Hagen, CEO and CTO, and co-founder, Bobby Skoff, about their business plan to capitalize on educating betting fans with in-depth stats and betting understanding with a gambling smart tool. They are offering a free pick of the day, with an updated daily tally compared to Las Vegas tallies so be sure to check it out on a regular basis at BetBuckets. Hagen stated, “Swish Analytics was born out of necessity: the lack of any truly accurate sports predictions products on the market.” They are building a one-stop shop for betting recommendations, game predictions, fantasy sports information, and original sports content. The value proposition of one central platform with computer driven, consistent accuracy is a compelling sports tech goal. Their community has about 2,500 users to date. I asked them if they have seen the newest Sonic commercial where the guys argue about the word, “swish” and “Swiss”. They had both watched it and agreed it was a good cross promotional opportunity for their startup so here it is (if only the second word was “analytics” and not, “horsh” or “horse”. On a startup budget, the executive team developed advanced metrics with coded proprietary data sets and machine-learning algorithms to calculate sports projections. The founders feel the Big Data explosion in sports has led to a trend by the leagues to study data science disciplines, compile algorithmic based information, and interpret the data using analytics. Their small management team consists of data scientists, designers and NBA basketball fans that together are bridging the gap between betting with emotion and trusting the numbers. All coding and development is done in-house. The bootstrapping business shares office space with sports radio station, Sports Byline USA, to save costs, like you can here for the World Cup. Hagen, previously created fraud-detection models for mobile payment startups. Corey Beaumont, CFO, and engineer of the back end, has payments industry experience. Bobby is focused on the user experience. Their combined mobile payment startups experience are transitioning from preventing swindlers from pocketing your money for both startups and fortune 500 companies in the payments space, to changing the thought processes of gamblers have yet to see the might about Big Data and the competitive edge it can bring to your picks. 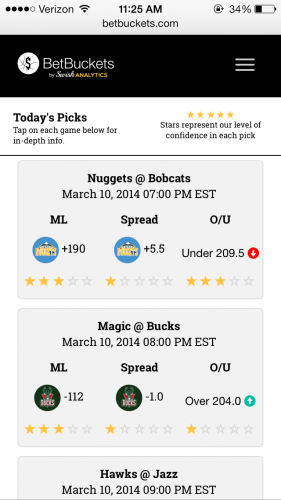 BetBuckets is an NBA predictions and wagering picks tool developed by Swish Analytics in 2013. The software process began with gathering information. Next, they initiated modeling and analytics, followed by aggregating content to users. Their algorithms are a product of millions of iterative tests. With over a hundred computer models, the nine best models are in place at the current time. It can take 6-8 hours to put out a single prediction. Their NBA data is a proprietary data set that has gone through one year of collecting data, in a sense becoming “artificial intelligence” that learns and gets smarter over time. Swish creates predictive algorithms using advanced machine-learning techniques and historical NBA data to give bettors calculated non-biased wagering recommendations through BetBuckets. They build accurate prediction engines through an iterative process. Each of their 100+ models is the work of millions of tests. They aim to be efficient and effective with every test cycle their models go through. They believe in leveraging the best technologies available in order to drive our systems. Their infrastructure is built on large-scale cloud computing tools and the most powerful processing machines in the world. Swish has a single platform that helps bettors by number-crunching data for members and presenting non-human and easy to use recommendations based on inefficiencies in the lines being set by Vegas. “If Vegas is inaccurate in setting their lines-which many time they are-our models will pick that up and predict the best bets accordingly,” says Hagen. The current systematic formula to pick winners for the night includes: Point Total Projections, Money Line Picks (straight up), Spread Picks, and Over/Under Picks. Bobby said, “Sports handicappers enjoy a 5% success rate over a full season,” later saying, “Our over/under is at a 9 percent ROI.” The high success rates of their picks are impressive. 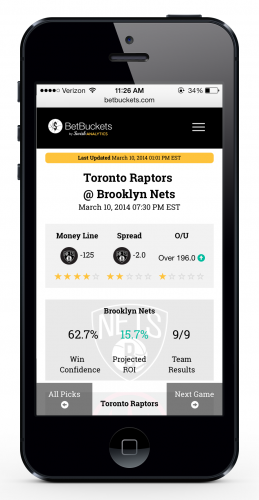 BetBuckets differentiates itself through superior accuracy, transparency, and ease of use. “Our focus is to deliver the most accurate computer-driven wagering recommendations for all sports, with very little friction for the user” said Skoff. Part of their R&D is to ask questions of their users and use the feedback to help improve the platform. BetBuckets uses a value-driven engine to formulate wagering recommendations. This means that when their models evaluate a matchup and the Vegas lines for that game, they identify situations where Vegas is inaccurately setting lines. In these instances, their algorithms will formulate betting recommendations that maximize the opportunity for returns. In many cases, they will recommend betting on the underdog of a game. Stars represent their supreme confidence in each betting recommendation, and the probability that the bet will win. Picks with higher Star Ratings are more likely to win and usually have smaller payouts. Picks with lower Star Ratings are riskier, but usually have much higher payouts. Star Rated picks vs. Vegas “Favorites”. They have built a proprietary data set that is comprehensive of all sports statistics dating back to 1940. Swing Analytics combine this with data being generated by every sports game, every day. This serves as the foundation for their unparalleled accuracy. They feed this data into their 100+ predictive algorithms that have been created after millions of iterations using advanced machine-learning techniques. Their models are trained to become smarter as they receive more data over the course of a season. The combination of their massive data set and extremely well-trained models allows them to produce the most accurate sports predictions in the world. Along with game outcomes, their algorithms make calculated wagering recommendations based on betting line data. Swish believes that sites like numberfire.com and teamrankings.com continue to compensate for sub-par accuracy by focusing on broader tools like fantasy projections Swish’s system is based on the fact that sports bettors trying to out-smart Vegas are at an inherit disadvantage due to “asymmetrical information” (The fact that Vegas uses computer models to set lines while sports fans are left with a wide range of hard-to-digest stats and blog chatter to make betting decisions). Initially, the NBA, NCAA Basketball and NCAA Football, the NFL, MLB, and European Soccer, and Tennis, are the sports they will target. They wanted our readers to know that wagering on tennis is big business. It ultimately depends on who is playing and data such as historical performance or court surface type. Joe and Bobby contacted me after reading about the “Kaggle Competition” March Madness machine-learning bracket contest sponsored by Intel that I blogged about. It turns out they spent about 15-17 hours modeling the competition data. As of Thursday before the Sweet 16 started, they sit between 50th-60th percentile overall, but 3/4 of their Final Four and the Champion (AZ) are still intact. “Not paying NCAA players makes it that much harder to predict,” according to Hagen. Professionals tend to have tendencies that are more consistent and measurable while college hoop players have less structure and different measurables. Hagen believes that by calculating NCAA probabilities when you build out March Madness brackets, you could beat 98% of people that have brackets who do not use this method. Of course I had to ask him about his beloved University of Oregon alma mater who went down to Wisconsin and what their bracket prediction was for that. He said they missed that one, which if you know how proud Ducks fans are, must have been tough to numerically swallow. 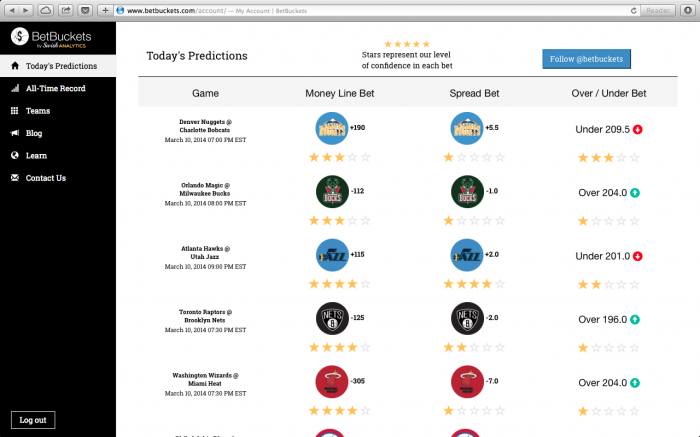 BetBuckets makes it extremely easy to leverage their predictions and picks for your site or application. With one line of code, you can embed their single-game or daily games betting recommendation widgets on your site. These widgets are updated throughout the day to reflect the most recent and accurate algorithmic picks. Have a sports site or betting application that has single pages for each game? The Single Game Widget is perfect for delivering a simple and easy to understand betting recommendation for every game. You may now someone who wages on sport and you have heard them use the terms underdog, back to back games and extended road trips. You definitely know someone in a March Madness office pools or that friend who makes picks based on pride. Vegas sets the lines and often public perception plays a major role, otherwise everyone would bet the Miami Heat to win every night. People have time honored and even generation honored betting habits and traditions. The movie, Silver Lining Playbook, is so awesome in terms of showing viewers how emotional wagering is no joke. The relationship between the bookie Father and his good luck charm, down on his luck, son, on games involving their hometown Philadelphia Eagles is what goes on in millions of homes around the world. Human bias and superstition will gets the best of you except if involves the Eagles juju, excuse all the f-bombs. The broadcast media trend of using Big Data and analytics has been set by ESPN. Companies like Numberfire, teamrankings and Predictionmachine.com, want to advise your betting business, and also that of Fox Sports, CBS Sports and NBC Sports. Swish Analytics is positioning to provide this kind of exact content for these large companies and other small businesses who want it too. They have a freemium model and subscription model in place as revenue streams. If a bettor spends $500 on average during a weekend, they feel strongly that paying a monthly fee will not be an issue with satisfied users. They may charge for special NBA Finals picks as a test. A sports book could use their line for their bets by embedding a simple widget on their web site for a small fee. Swish wants to consult with teams about draft picks so the $500 million bad decision, as may be the case with Kevin Durant, does not happen to their client. The possible NBA MVP this year was picked in 2007 by the Seattle Sonics, now OKC, after Greg Oden was selected number one overall by the Portland Trailblazers. Another plan is to leverage the information they decipher into original blog content, like that at Grantland or here at Sports Techie. A new API in 6-9 months for larger players and media capacities. Plans are to hire over the next 6-12 months. Swish plans to launch a similar NFL-focused application before the 2014 season begins. The company plans to launch future products that cater to all sports enthusiasts as betting becomes a more integral part of sports applications. Their NFL model might offer one free game as a teaser to the serious or amateur gambler who wants the same kind of accurate data sets for the rest of the 16 game schedule. An iOS app may be released in August which will be a mobile version of the web site for the iPhone and iPad. Android is also in the design pipeline. A coaching app that assists with personnel and even strategic decisions is possible. We also discussed the importance referee criteria and a possible app. Monetization is down the line but advertising and ad dollars are sure to increase as more users use their service. They expect a trickle down effect to colleges and high schools will happen after they dominate professional sports. They are interested in investors to “aggressively expand” its sports technology application suite across different sports and markets. Sports Techie, Their mission is to deliver the most accurate algorithmic predictions, analytics, and content to sports bettors and fans. They want to pioneer data driven predictions and make it their Bay Area niche. It feels like they are on the right path. I asked them what Phil Jackson, the New York Knicks new General Manager, would say about Swish Analytics. They said they want an opportunity to discuss the triangle offense about what their sports technology can do for him and the Knicks organization. Their free pick of the day has an updated daily tally, my advise is to give them a week and monitor how they do. This small sample size may go 7-0, 0-7 or somewhere in the middle, giving you enough evidence to make an educated decision. She’s making a lot of sense, Bob.